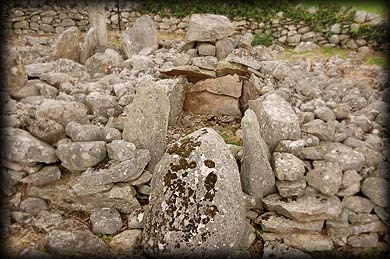 Hidden away in the townland of Aghnaskeagh and surrounded by dry stone walls are two very interesting cairns just 45 metres apart. Access to these cairns is via a field to the south and even this is quite tricky as the dry stone walls are surrounded by a barbed wire fence. 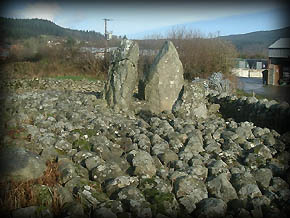 The first and more westerly of these cairns is a portal tomb with the capstone missing. You can see the remains of the westerly Portal tomb in the picture above. 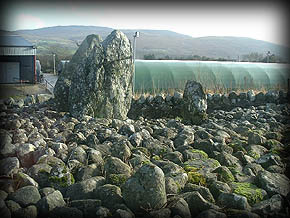 Two huge portal stones, each 2.8 metres high, and a back stone are situated at the Eastern end of the cairn. Six bronze age kist tombs were later added to the other end of this egg shaped cairn. The easiest way to the tombs has now been blocked by what looks like a mushroom farm. 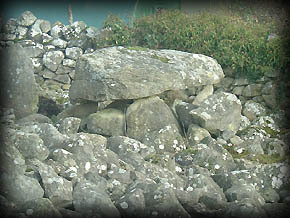 Just South of the portal tomb is a chambered cairn which has four chambers at the eastern end of the cairn, pictured left is one of these chambers known as a kist. The picture below shows another chamber with the kist behind it. The Cairn is more circular than the other one and also more interesting. Archeaologists discovered a burial belonging to the early Christian era in this cairn. Situated: From Dundalk take the N1 North, after 3 kilometres you come to a roundabout go through and take a left turn at the next crossroads and right at the next crossroads, then turn right, after 500 metres you come to a derelict cottage, next to the cottage are 2 gates take the furthest right and follow the field wall down to the cairns. Discovery Map 36: J 076 137. Last visit September 2007.